It is starting to look quite festive around our house. 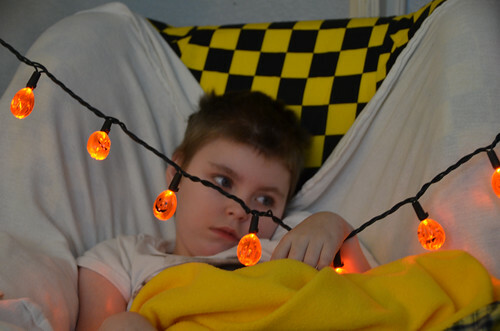 With Max's Halloween Birthday just a week away, we've got the house spooky and glowing with pumpkins! 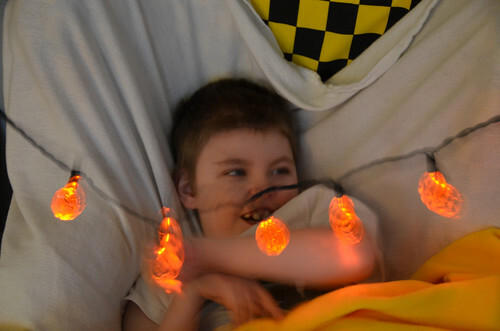 Max has a love of lights. 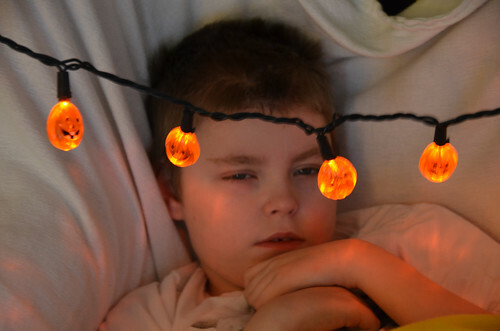 At Christmas time, when we can't go into shopping malls, or caroling concerts with him, we'll drive for hours to let him look at the colorful lights. We wrap lights around his feeding pump pole, and have two Christmas trees up for him to gaze at. 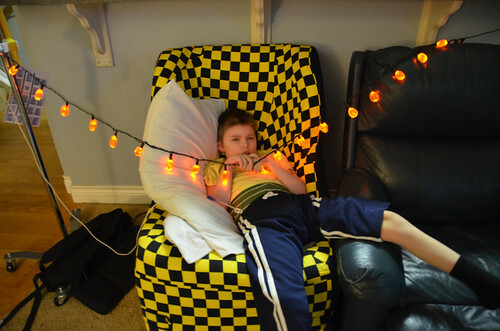 When we found pumpkin lights, we knew we would have to string them up for Max to see. He loves to hold them close to his face, and grab onto them with his hands; something that isn't an easy task for him. He also loves to watch them dance, so he kicks at them to make them move. I love watching him interacting with the world around him, and being involved with things that make him happy. This is a short video of his acrobatic moves to kick at them. He does this time and time again until he kicks them down. We put them back up and he goes at it again. We call it physical therapy, occupational therapy, vision therapy, and just plain ol' kid playing fun! And, of course, not to forget to post at least one picture of the boy with his dog...or should I say, Grandpa George and Grandma Georgina. They were snuggled up under the covers, and sometimes, the only camera close by is the phone, so we'll have to make do with the washed out version of this scene. George sure does love to snuggle with his Max! Max wasn't sure what he thought of sharing his covers with such a warm puppy. 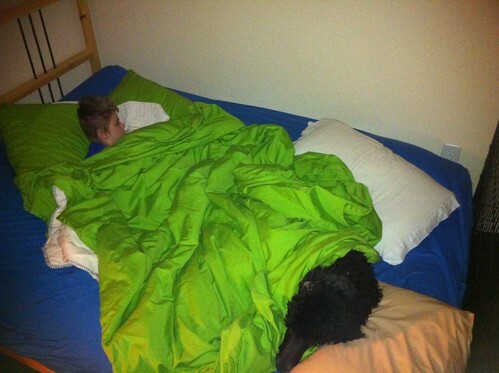 He was getting a little too hot, so George got in his bed, and they're both sleeping beautifully now. 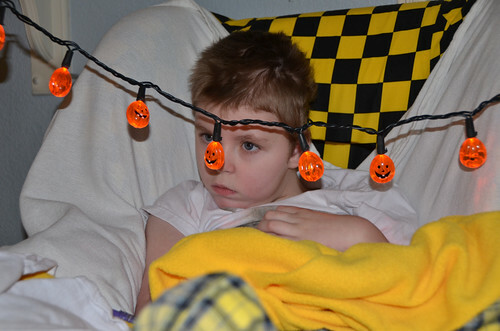 Max I love, love, love your pumpkin lights and watching you play with them. Have a fun week.